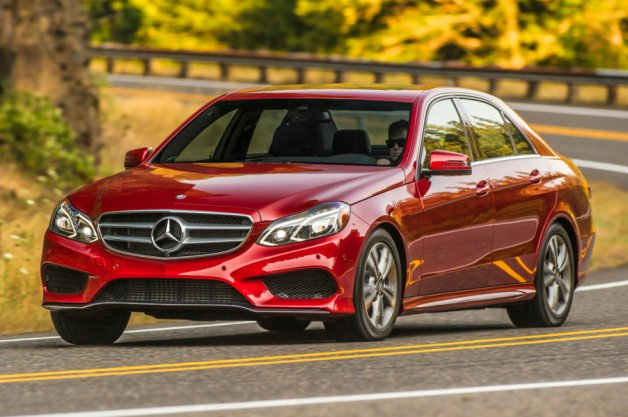 The newest Mercedes-Benz E-Class – the 2014 E250 BlueTEC sedan – has achieved an impressive estimated EPA rating of 45 miles per gallon on the highway and 28 mpg around town. The first diesel E-Class to be available with 4MATIC achieves best-in-class fuel efficiency for a midsize luxury sedan and for the entire industry in the same size range. When equipped with optional 4MATIC all-wheel drive, its fuel mileage numbers are still an impressive 42 mpg highway and 27 in the city. No other diesel sedan offers a better EPA fuel economy highway estimate. It’s clear that the big news for 2014 is the high-efficiency turbodiesel engine that powers the E250 BlueTEC. The all-aluminum, in-line four-cylinder engine makes use of four valves per cylinder and dual overhead camshafts with vane-type variable valve timing, producing 195 hp and 369 lb-ft of torque. To smooth out the inherent vibration of an in-line four-cylinder engine, two Lanchester balance shafts spin at twice crankshaft speed in sophisticated, low-friction roller bearings. During normal operation, the advantages of this two-stage turbocharged system can be felt – no turbo lag, fast throttle response, a broad torque curve across the entire engine speed range and noticeably improved performance. What’s more, the 369 lb-ft of torque is readily available at 1,800 rpm. Fuel pressure for the BlueTEC direct fuel injection system is 2,000 bar or 28,400 pounds per square inch, which makes possible even more power and lower exhaust emissions. Higher ignition fuel pressure means the four piezo injectors can be adjusted even more precisely as engine load and speed change. This system places the four-cylinder diesel at the head of the field when it comes to diesel engines for passenger vehicles. To ensure the E250 BlueTEC meets exhaust emission regulations in all 50 U.S. states, the BlueTEC system uses AdBlue injection to make the diesel as clean as a state-of-the-art gasoline engine. Newly accessibly through the fuel filler door, a water-based urea solution, AdBlue, is carried in its own small tank and metered into the exhaust in minute quantities, so the tank only needs to be refilled during routine scheduled maintenance. When AdBlue is injected into pre-cleaned exhaust gas, ammonia (NH3) is released, converting nitrogen oxides into harmless nitrogen and water in a downstream catalytic converter. Called SCR, for selective catalytic reduction, this process creates the most effective method of exhaust gas after-treatment currently available. As modern all-wheel-drive systems become more refined, they are becoming increasingly popular, especially in the luxury car market. With negligible weight and fuel-efficiency tradeoffs, full-time four-wheel drive provides year-round traction and stability benefits on both wet and dry roads. Optional on the E250 BlueTEC, the latest Mercedes-Benz 4MATIC system is cleanly integrated into the 7-speed automatic transmission so it fits right into the standard body and utilizes the existing front suspension. Fuel efficiency has been improved, due to a number of innovative measures that minimize the energy needed to turn the extra gears and shafts. Mercedes-Benz expects an approximate 50/50 national installation rate between rear-wheel drive and 4MATIC on the E250 BlueTEC, keeping in mind northern States usually order and stock nearly 100% 4MATIC when available on passenger cars. • DISTRONIC PLUS with Steering Assist: radar-based cruise control system with semi-autonomous steering inputs that can work from 0-124 mph depending on road conditions. Aside from the E250 BlueTEC sedan, other 2014MY Mercedes-Benz U.S. models with BlueTEC clean diesel include the GL350 BlueTEC 4MATIC (V6), ML350 BlueTEC 4MATIC (V6), and GLK250 BlueTEC 4MATIC.